This angel would have formed part of an Annunciation scene (the figure of the Virgin is now lost). The right hand raised in a gesture of speech and the forefinger pointing upwards suggest a reference to God the Father, or the presence of the Holy Spirit. The angel probably once held a scroll in his left hand, which would have been painted with a text. Stylistically this sculpture looks back to an earlier tradition of sweetly smiling figures, which developed in the 13th century and influenced by sculptures at Reims Cathedral. The unusual iconography with the angel approaching from the right is found in illuminated manuscripts dating from after 1415. The style of the carving and iconographical evidence illustrated by painted Annunciations suggests a date between 1415 and 1450. 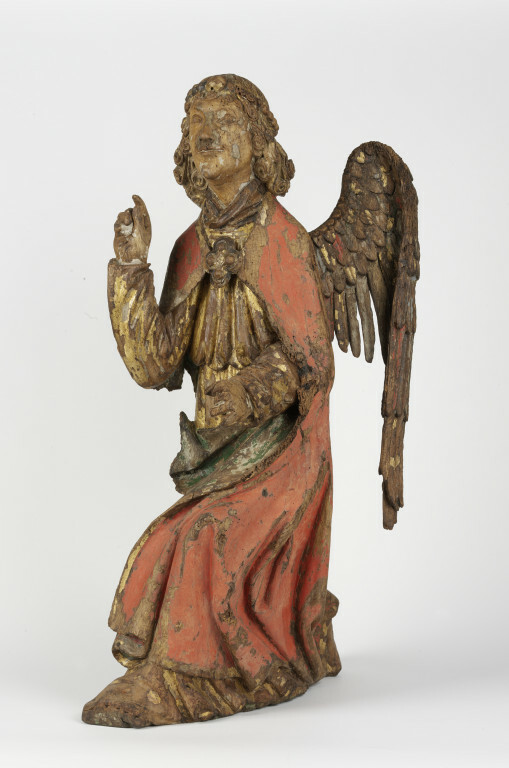 The Angel of the Annunciation, oak, gilded and polychromed. The archangel Gabriel rests on his right knee with his left foot placed in front of his body; the right forearm is raised with the hand pointing upwards and the left arm is bent at the elbow in a right-angle. The head is slightly raised, the hair falls in ringlets and the angel wears a beaded headband with a gilded jewel above the centre of the forehead. He is clothed in the vestments of a priest, which retains much of the polychromy and gilding. J.H. Fitzhenry Collection, London: on loan to the V&A 1910-01914; bought from the executors of J.H. Fitzhenry in 1914. Considerable damage has occurred, including the loss of one wing, the remnant of which is pegged into the back of the figure with and iron square-headed nail. The fingers and thumb of the left hand are broken and there is a small nail hole through the back of the hand and another next to the left foot. The first and second fingers of the right hand are also damaged. The left forearm appears to have been pegged into position at the elbow and an area of uncarved wood is visible where the edge of the cope has broken away. A wood peg (not original) supports the surviving wing which is slotted into a groove in the back of the figure. The sculpture has suffered from woodworm attack in several places, including the head, the cope and the wing. Additional damage has occurred to the drapery at the front and right side of the figure, the left side of the hair and the upper part of the left arm. This angel would have formed part of an Annunciation scene (the figure of the Virgin is now lost) : the lack of detailed carving on the back indicates that the group would have been applied against the back panel of an altarpiece, but because there are no obvious signs of how it was attached it was probably fixed at the base and simply rested against the backboard. There is an angel of similar type (but not style) of about 1420-30 from Lubeck in the museum fur kunst und kulturgeschichte in Lubeck (Wittstock 1981). 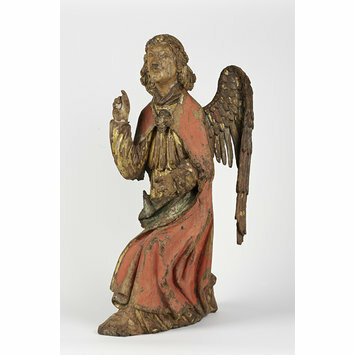 The right hand of the london angel is raised in a gesture of speech and the forefinger pointing upwards suggests a reference to God the Father, or to the presence of the Holy Spirit, which is often represented by a dove in scenes of the Annunciation. The angel probably once held a scroll in his left hand (attached to the base at the hole by the right foot) which would have been painted with a text. This is frequently illustrated in French manuscript illuminations of the first half of the fifteenth-century and it is also found on sculpted versions of the scene: the annunciation group on the tomb-chest of Archbishop Friedrich of Saarwerden in Cologne Cathedral, executed before 1414, is a German example. As the angel is looking slightly upwards it is likely that the Virgin was standing rather than seated as seen in the early fifteenth-century stone group of Notre Dame at Ecouis, Eure. The Ecouis group shows the more usual iconography of the angel approaching from the left, while the present angel enters the scene from the right. This relationship between the Archangel and the Virgin Annunciate is extremely rare in French art of the Gothic period before about 1415 when it seems to have first made an appearance in the work of the Boucicaut Master (Denny 1977 p.52) several examples can be found in manuscripts illuminated in his workshop including one in the Walters Art Gallery Baltimore (Meiss 1968, pl.130). Meiss suggested that the position of the scene on the right hand page of the manuscript accounted for such a layout as it made a more satisfactory composition. This would not apply in the case of sculpture and panel paintings, as exemplified by a fragment of a panel in the museum at Laon from the workshop of the Rohan Master (Ring 1949, pl.42 cat no. 89) which also shows the angel in a similar pose top the London angel. The shortage of surviving French wood sculpture of this period makes comparison with similar objects difficult, but on the iconographical evidence illustrated by painted Annunciations it is likely that the present sculpture dates from about 1415-1450. Stylistically the work looks back to an earlier tradition of sweetly smiling figures which developed in the thirteenth century from sculpture on the west front at Reims Cathedral (Saüerland 1972 pl.200) a later painted wood sculpture of the second half of the century from the region of Saint-Germer (Oise) in the Musee des arts Decoratifs, Paris (Vitry and Briere 1904 pl. LXXXIII/5) has a similar expression. although the carving on the present angel lacks the quality of these earlier examples, the polychromy and gilding would have produced a rich and colourful effect.